A cost effective, fast turnover was required for this project and this was supplied. We have the capacity to produce up to 3000 sqm of floor space per week. Cost is brought down by speed and accuracy. Working with Liviero on this building Eco Truss Africa were commissioned to supply a roof for within the mine. As the mine has strict safety regulations , Liviero had to have a pre-manufactured steel roof that had a long life span. A canopy to cover the front door from the rain was also specified. A mono pitch canti-lever solution was proposed and approved by the safety officer and subsequently engineered. All of our products are screwed together with SABS approved tex screws and require no on site welding or painting. The large canti-lever offered cover from the rain. We worked in collaboration to Liviero to install the roof and its covering, as always before the required project deadline. 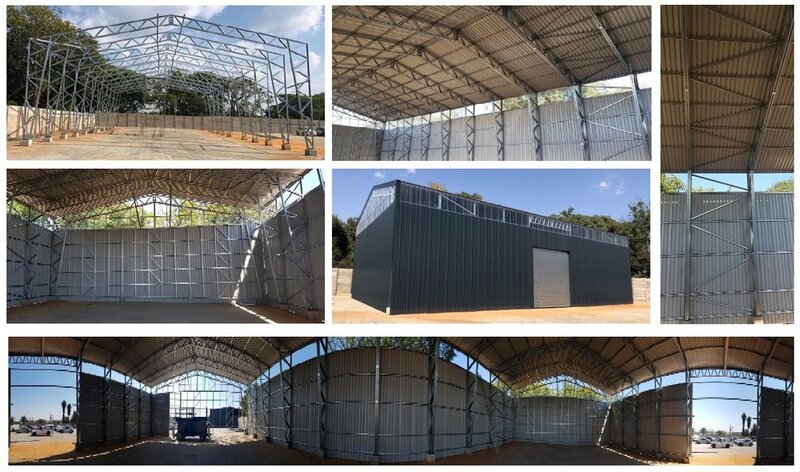 Working for the main contractor on this development of storage units Eco Truss Africa were commissioned to provide roofing solution for in excess of 900sq meters. A mono pitch cantilever solution was proposed, approved and subsequently engineered. Mono pitch was selected to direct rain run off to the rear of the building, whilst the cantilever provides for shelter form both sun and rain for the end users of the storage units. In this particular instance as the contractor was experienced in the installation process, the trusses was provided on an assembled supply only basis. Working with a commercial building developer we were given the brief to clear-span a roof truss 26m whilst being able to erect without the use of a crane. We manufactured on site with our mobile containerised factory. Each truss weighed 300kg and we were able to split the two-ply truss allowing each section weighing 150kg to be lifted by rope. The engineering and design of our roof structure (even at 26m long trusses), allowed the developer to erect within 2 weeks using their in house team.